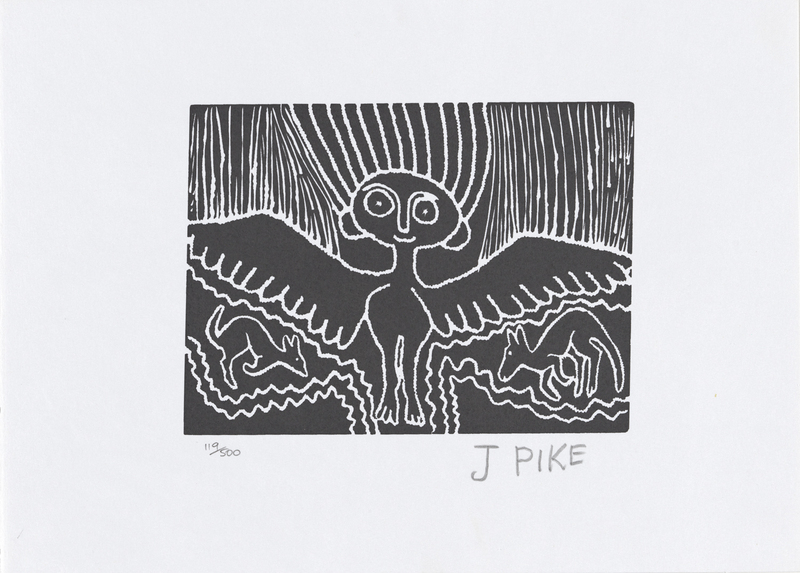 Inscribed 'J PIKE 119/500' below image. Inscribed 'ATS_1036/ATS_1036_027 2014L/0294 P16' on reverse. Circular label inscribed '524' on reverse. Mangkaja or Wirringarri is a white bird from the Dreamtime. He is like an owl, with black and white markings around his eyes. He travels at night. Mangkaja came from Kiyili way. Some people were frightened of this Mangkaja. They found him sitting down on a log. They tried to kill him, but he flew up very high, and where he landed there sprung up a waterhole, Mangkaja Kura. Nearby this place is Malajapi, the campsite of the Mala spirit. Mala is the little bush kangaroo. The people come here to tell the spirit to send plenty of mala to the land.